Explain to me how, in a nation of immigrants, we can hate and revile those who seek to do what our ancestors, more distant for some and less distant for others, have traditionally done: Come to the ‘land of plenty’ to escape poverty and war and oppression in the old country. I can pretty well promise you my ancestors came here from Scotland and Wales and Russia and Bavaria because they didn’t much like what was going on in the seventeenth and eighteenth and nineteenth centuries CE and decided to vote with their feet; I’m as close to positive as a man can be that yours did the same in at least one of those centuries. And for First Nations folks, the only difference is the number of the century. … The 150th century BCE is surely a long damn time ago, but the only known place on Earth’s surface humans are truly native to is Africa, and they got enough troubles, so let’s not shout about how everyone should go back where they came from. Let’s not shout at each 0ther at all about who belongs where. Let’s accept that we all belong where we’re contributing positively to our families, our neighbors, our society … human society. For the Khan family’s sake, and for others’ just like them. 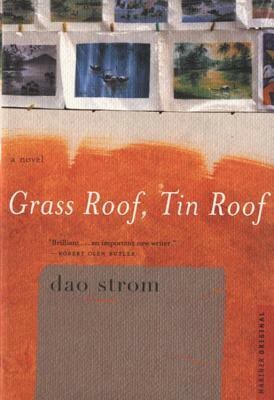 Grass Roof, Tin Roof, by Dao Strom, brings Tran, a literary Vietnamese woman and her children by a vanished Vietnamese father to the USA in the 1975 exodus. Tran, unable to speak English well and unemployable in her adopted homeland, marries a mercurial Dane, himself an immigrant to these shores, and they set about creating a family in California’s backcountry. As is so frequently the case, immigrant parents sacrifice and compromise and work so that their children, the little alien ingrates, will be truly American and have all the American advantages. No one has it easy in this family of mixed nuts: Dad is off his gourd, Ma is Ostentatiously Long Suffering, Son is depressed and in a relationship with a girl who needs to be shot to put everyone out of her misery, First Daughter is feisty to the point of caricature, and Second Daughter is terrified. How very, very, very American that is. All of it. Depressed, angsty teenagers? Good heavens, I think this country invented them. Cruel fathers and uncomprehending mothers? See all works of literature from Pamela to The Life and Opinions of Tristram Shandy, Gentleman to What Maisie Knew to Catcher in the Rye to whatever book you care to mention on any publisher’s fall 2016 list. Dao Strom’s own life is transmuted into silver if not gold as she writes her way out of the bewilderment of growing up neither fish nor fowl. 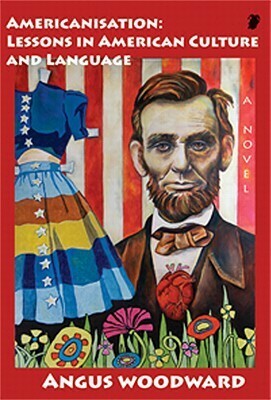 She is quintessentially an American writer writing out of her uniquely American perspective. 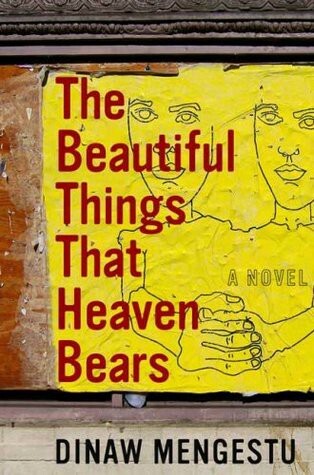 The Beautiful Things That Heaven Bears, by Dinaw Mengestu, introduces us to Stephanos, called Sepha, an Ethiopian immigrant who fled his country’s bloody civil war that began in the 1970s. He landed in Washington, D.C., and has built an existence running a small grocery store in what was once part of the African-American ghetto and is now a ‘gentrifying’ neighborhood that sees no point in shopping local stores when they’re so worn out and run down. With the exception, that is, of Judith. She is one of the white incomers to the neighborhood, but has some street cred because her daughter, Naomi, is biracial. (Stupid term, that; Neanderthals are extinct and our next closest relatives, the bonobos, can’t interbreed with us.) Sepha and Judith recognize each other at once: Neither is at home anywhere because each has surrendered, in fact fled from at full tilt, an identity that would have killed them body and/or soul. Their familiarity with each other’s broken places makes each a little uncomfortable, and their social relations center around Naomi, with whom Sepha is a little in love (in a paternal, un-icky way). More and more ‘gentrification’ leads to neighborhood tensions; in spite of his many years’ standing in the neighborhood, Sepha’s caring attitude for Naomi and Judith makes everyone around him wary. Judith is a past master at sending mixed signals, and her terminated relationship was with a Mauritanian man, so perhaps her guard is up around African men. Sepha unfreezes for a moment, and as the novel ends, we’re not sure what will become of him now that he finally wants something enough to work for it. In spite of his Ethiopian name, Sepha’s is a story of any American man who, in the Land of Plenty, can barely be bothered to do more than eke out the minimum existence for fear of being confronted with Responsibilities and Feelings. 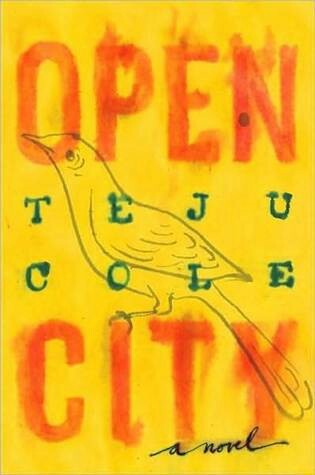 Open City, by Teju Cole, is the extended interior monologue of Julius, a Nigerian immigrant to New York City and candidate for his MD in psychiatry (The irony of this will only get more delicious as you read on in the book.). He has ended his most recent relationship and now walks, walks, walks around Manhattan and talks to strangers. About anything, about everything, about as deeply as splashing in a rain puddle. Many, many fancy intellectual names are dropped, and if I hear one more reference to Sebald’s The Rings of Saturn in reference to this book, I cannot be held accountable for my violent response; it’s clear that Cole isn’t putting up a front of knowledge in his magnificently meandering writing, but the poseurs come out swingin’ in their evaluations of this one. Julius is in constant motion, in constant if insubstantial conversation, in desperate need of the therapy he is supposed to dispense. He is afraid of himself, of his past, of his blank interior walls. When we learn the probable reason for this emotional freeze, the rest of the novel snaps into focus. How many of us are descended from the bloody lineages of abusers fleeing their crimes and complicities? How many people ran to America over the centuries simply to escape the need to be truthful in the old country? I don’t recommend opening the family closet too far unless you’re ready for Julius by any other name to fall out into your appalled arms. 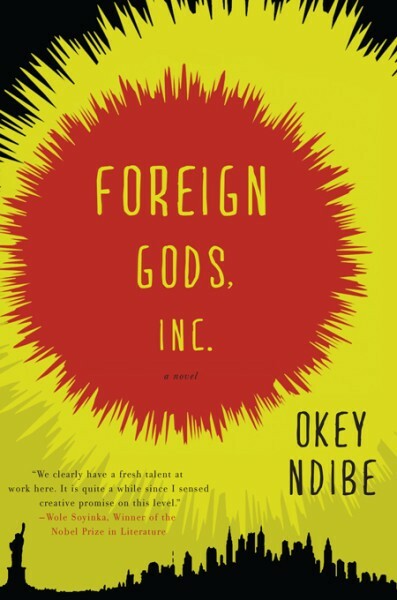 Foreign Gods, Inc., by Okey Ndibe, could easily be a full dictionary definition of schadenfreude. You know it’s cruel to laugh at Ike, the Nigerian New York cabbie, as he wriggles and twists and blames, blames, blames his way away from the self-knowledge that would make him face up to his harpy of a wife, his harridan of a mother, and scariest of all: his bookie. It’s damn near impossible not to at least grin as Ike returns to Nigeria to see if he can’t scam his home villagers out of an important cultural artifact, given the world’s opinion of Nigerians as scammers one and all. But Ike’s return to New York is, well, it’s safe to say that it’s a dangerous thing to point and laugh at someone who’s playing Cleopatra and barging down Denial. All those other fingers are pointing right back at you, Laughing Eyes, as you — if you’re at all honest — confront your ever-so-American need to push the blame, any blame, rightly or wrongly assumed and assigned, onto anyone else but yourself. Americanisation: Lessons in American Culture and Language, by Angus Woodward, is laugh-out-loud funny, surreal, and (either I’ve missed a trick or) the strangest, very original format for a novel I’ve seen: A foreign-language textbook structured as dialogues, cultural lessons via conversation starters, lists, and vocabulary words. Biti, our hero, hails from a family of goatherders in “South America’s Lichtenstein,” wherever the hell that might be … and goats? Biti has come to the United States to get a degree in Spiritual Geography at an unnamed university. He falls in with … I mean falls in love with … an American woman who takes advantage of his naïveté for her own, and his, of course, financial enrichment when a minor mishap occurs. It’s impossible not to laugh at lines like “Lobster Shell: Crack!” which pepper the Dialogues, reminding the reader that the author is letting you in on a joke. The joke’s on you, though, because this lampoon is of how Greed, the American Way, is a dreadful and contagious spiritual infection. Funny as it is — and the novel is genuinely funny — it’s wise to heed the little tickle of recognition in the innocent from abroad who falls and falls and falls, only partially and intermittently rising, as self-knowledge and integrity are bleached away in the vats of American Whitener. 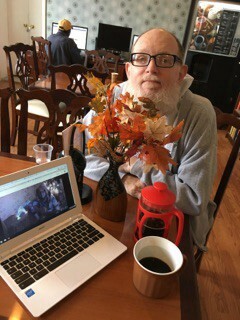 RICHARD DERUS (a.k.a. ExpendableMudge on Twitter) is a biblioholic, a tsundoku carrier, and a passionate reader. From underneath his tottering towers of unread tomes, he blogs obsessively about his darlings at Expendable Mudge Muses Aloud, where many otherwise unknown books are praised, panned, or poked fun at; The Oak Wheel, where he blogs enthusiastically about short story collections; The Small Press Book Review; Shelf Inflicted, where he was a founding blogger; and wherever else he can find editors who need content, as long as it’s about books. Literature to change your lightbulb.